There are tons of digital photo picture frames on the market and none have them have really wowed me. 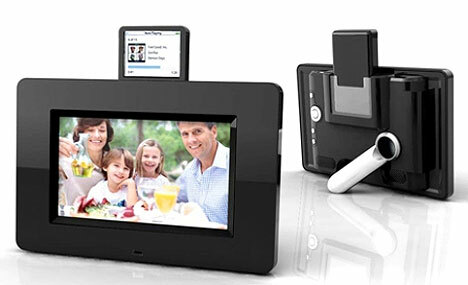 Mustek has come up with something original, though, with the PF-i700, a 7-inch color digital photo frame with an integrated Apple iPod docking station. In addition to doing the usual digital picture frame duties, it can play your iPod files. The screen is about three times the size of the iPod’s screen, has a 480×234 resolution and a widescreen 16:9 aspect ratio for playback of movies in MPEG format, Xvid and motion-JPEG formats. The frame can be used in both portrait and landscape positions, and a removable stand design allows for wall mounting. The PF- i700 also has stereo speakers plus a headphone jac. It incorporates a card reader for SD, xD, MMC, MemoryStick and MemoryStick Pro cards and a USB 2.0 port for thumb drives or connecting to a PC. The Mustek PF-i700 is expected to be available in March 2008 with an MSRP of $129.99 (U.S).